1. Season salmon with salt and pepper. Brush with mustard. Dredge into flour. Pan grill until half done. Flambé with white wine. Set aside. 2. Have ready microwave safe ceramic dish and brush surface with melted butter, then bed with potato on top with half-done salmon and set aside. 3. 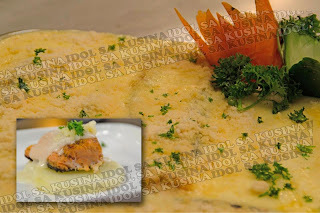 Boil milk, add white sauce, all-purpose cream, chicken powder, and then pour over into salmon, grated mozzarella cheese. Cover with cling wrap. 4. Place into G.E. MICROWAVE OVEN for 5 mins. then sprinkle on top with parmesan cheese and chopped parsley.